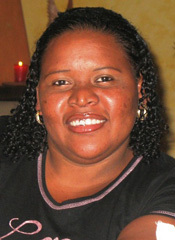 Marta Honoria Castillo was 26 yearsold when she was selected as a GOJoven Fellow. Her professional experience includes working as a trainer in the Association of Garifuna Women of Guatemala. In this capacity, she advocated for the rights and health of Garifuna people throughout the Izabal District. Marta served for two years as President of the Youth and Children Parliament of Guatemala. She has training and experience in conflict resolution, teamwork, community development and HIV/AIDS. She completed two years of university studies in Business Administration and recently obtained a professional certificate in Political Leadership and Human Rights in Honduras. Currently, Marta serves as the Training Coordinator for GOJoven Guatemala. She hopes to become an international advocate for laws and polices that support women, strengthen organizations and empower youth.